I quite often come across links that I find interesting, full of things I should know about and sometimes just down right fascinating. Here are a few of them that I have been reading in the last month. Feel free to link any of your own in the comments. Let’s look at it as a community noticeboard board. I watched this with my kids recently- it brought up a hell of a lot of different discussions….important ones, really important ones. Please take the 20 minutes to watch it. Are there any green links of interest you would like to link to? 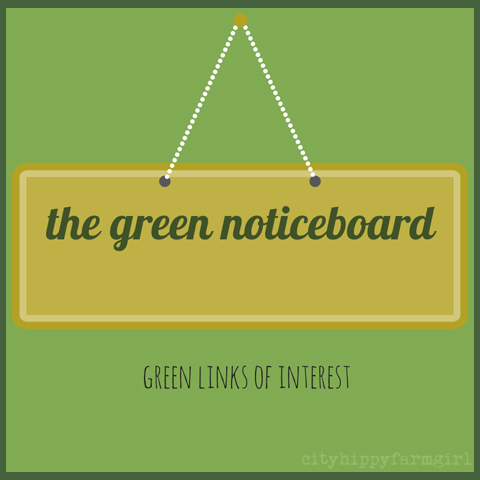 This entry was posted in Going Green and tagged green links of interest, the green noticeboard, waste deep by cityhippyfarmgirl. Bookmark the permalink. Really enjoyed this! Thanks for posting! It’s well worth a watch isn’t it. Really interesting video and I love a bit of Costa! I was quite surprised by my time in Australia at how poor I thought the nation was at recycling compared with the UK. Recycling rates in Sydney seemed very low. It didn’t seem to be part of the culture to recycle as much as you could. Most areas of the UK now also have green waste collection where the Council will collect food waste for composting instead of sending it to landfill. It is best to compost at home, and not waste food to begin with, but still a good option for the chicken bones once you’ve made stock with them. The housing stock in Australia was pretty shocking too. I lived in a modern apartment (5 – 8 years old), but it had no insulation to speak. This meant it was cold in winter and too hot in summer, requiring energy to heat and cool. I resisted heating and had a fan, not an air con unit for cooling, but knew a lot of friends and colleagues who just threw energy at the situation. It doesn’t need to be that way with better building standards. Water meters should be universal too so that people pay for, and therefore consider, how much water they use. Reducing is much better than recycling, and I think the videos message about us shopping smarter (packaging wise) and not wasting food is a message we can all learn from. There is so much in there isn’t there Richard. The food waste collection is being trialled in a few areas in Sydney at the moment I believe. It will be interesting to see how it goes ahead…are there any obvious problems with the system in the UK? The video states that in four years time the UK will be out of land fill areas to use, I guess that’s why your area is ahead of us in terms of doing more, there is an incredible sense of urgency that just isn’t felt here yet. I feel things are changing here, but the rate in which it’s doing so is painfully slow. Painfully. Housing? I know, I know…no insulation, cheap windows that hold nothing in or out and the list continues. I’m not sure what ‘green’ standard houses have to be built at now, but there is a hell of a lot of people paying a price (on so many levels) for cheap and poorly built housing in the past. And yet, you’ll still pay through the nose to buy it as well! Food waste collection seems to be working pretty well in the UK. Not everywhere does it, but most do. Collections are weekly and there don’t seem to be many problems, but in an Aussie summer it could get a bit smelly by the end of the week! It is the same in London that people pay incredible amounts for houses and don’t give a second thought to how well their built / what the running costs will be like. I don’t think I’ll be brave enough not to fit a boiler for heating during the winter, but I want to aim for something that is so well insulated that it virtually never comes on. Thank you for the gentle nudge Brydie. That was an interesting video. I think I do pretty well on the whole but I’ve been conscious of back sliding lately and that was a good gee-up. When i go fruit and veggie shopping I still carry with me a large cane basket I bought in 1982. Store holders would often comment what a lovely basket it was and how much it held and I would pipe up “yes, it’s my save a tree basket” and I got my share of “whatever!” looks. Watching the video made me conscious of just how much of the fruit and veg I put into my lovely basket is now pre-wrapped in plastic, even though I have a little pouch of gauze bags attached to the basket handle – I’ve been forgetting to use them. I’m now resolved to ask my favourite green grocer if I can decant my vegetables from his plastic into my bags (even at our local markets things are often pre-packed) – wish me luck. And I love Costa! Jan I’m all for gentle nudges, so thank YOU 🙂 It had the same effect on me too, I want to do more. It’s simply not enough. And a basket that you’ve used since 1982, that dear lady is a lovely solid basket that must have held the beginnings of rather a lot of dinners. Loved this. As a 66 year old who has followed your blog for some years I can tell you that I lived through the alternate years of the sixties and seventies with two kids. I have never stopped making bread and always take a picnic lunch and thermos when I go out for a day – even when I go to a larger town to shop. And, of course, no plastic bags – I actually will use the paper bags provided for mushrooms instead. I loved watching this. I go through huge phases where we as a family are great at waste and plastic etc but then all of a sudden I look closer and both have crept back into our lives? Being mindful and teaching our kids to be mindful is so important, so thanks for the reminder!